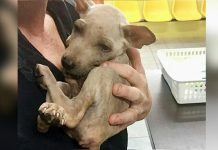 Any animal lover can’t bear the sights and sounds of a creature in need of help. That’s why every day the internet gets flooded with pictures, videos, and tales (or tails!) 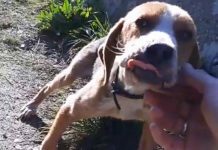 of animals getting rescued from dire situations — we just want to see the happy endings! 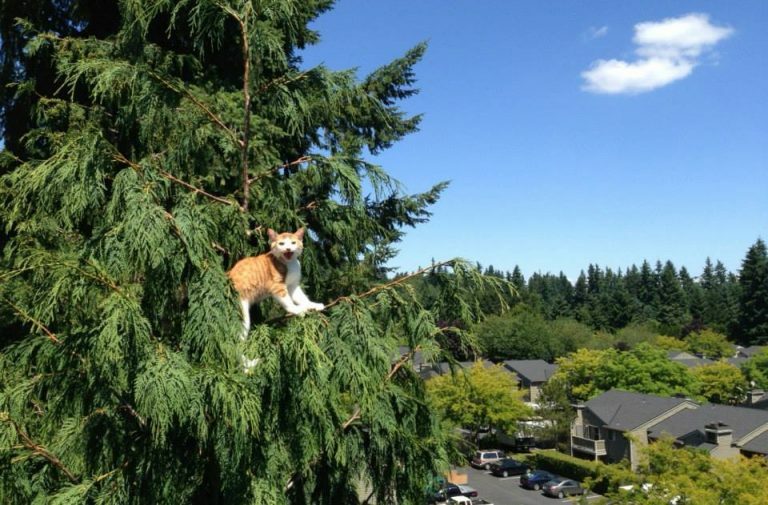 It was a day just like any other when the tabby cat Hamburger Belly became stuck in a very tall tree near her owner’s home in Seattle, Washington. 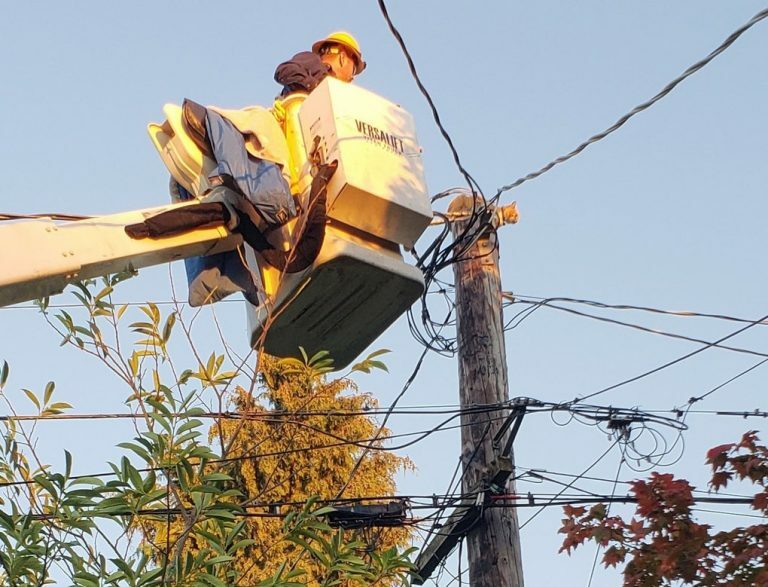 With no way of getting down by herself, the situation was looking dire — one of those nine lives were on the line. Not far from the tree, Shaun Seers heard Hamburger Belly’s cries for help. Luckily for the stuck cat, he had a very particular set of skills and expertise and decided to lend a helping hand. Shaun was an arborist. 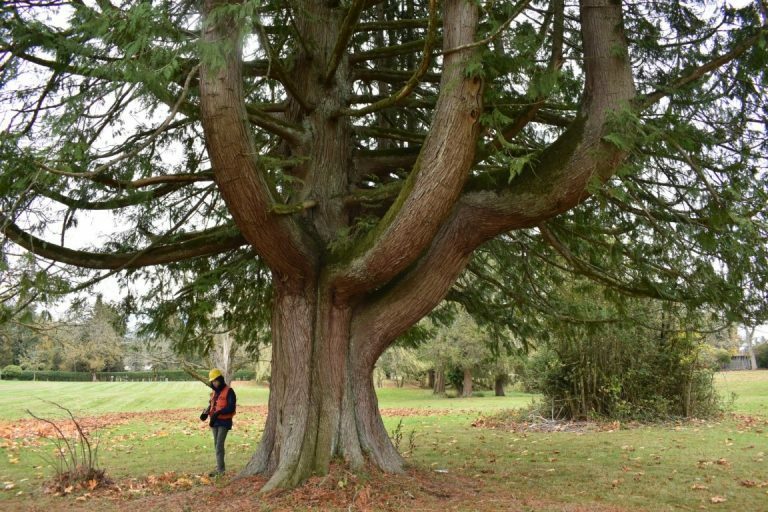 He knew nearly everything about trees, and, as he was on the clock, he happened to have tree-climbing equipment with him as part of his inspection. 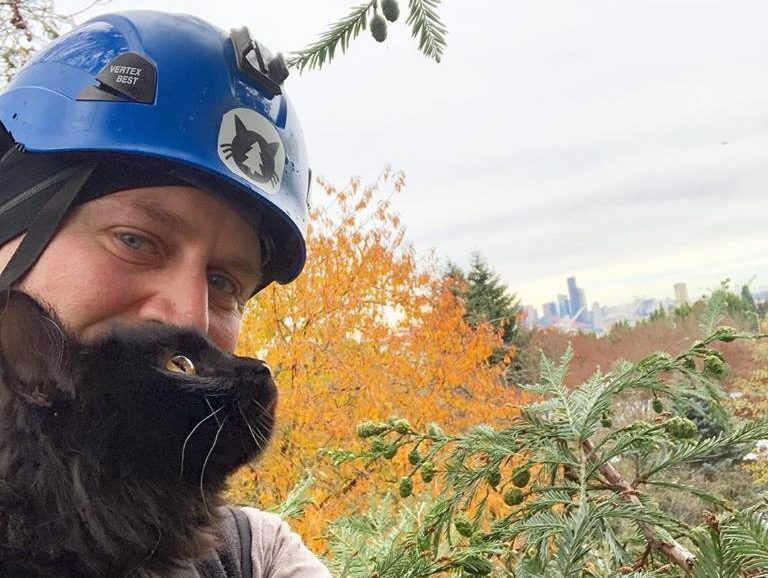 Once he located the tree in which Hamburger Belly had already spent several days, he attached his gear and headed to the top branches, towards the meowing cat. There, Hamburger Belly greeted the stranger with open paws. She clung to him like she had never clung to a human before as they slowly made their way back to the ground. There, Shaun checked Belly’s collar to find her owner. 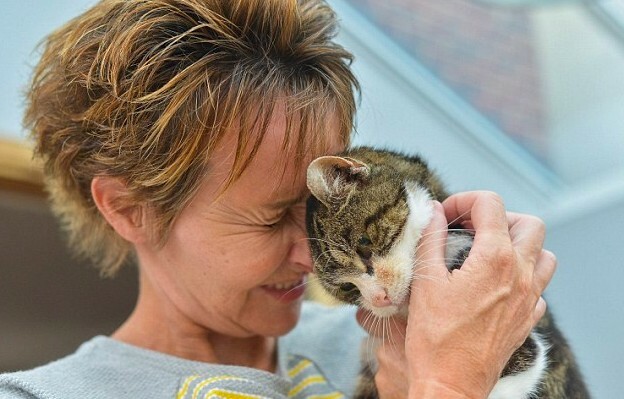 When Shaun returned the kitty cat safe and sound, seeing the look on her owner’s face was priceless to this animal lover. 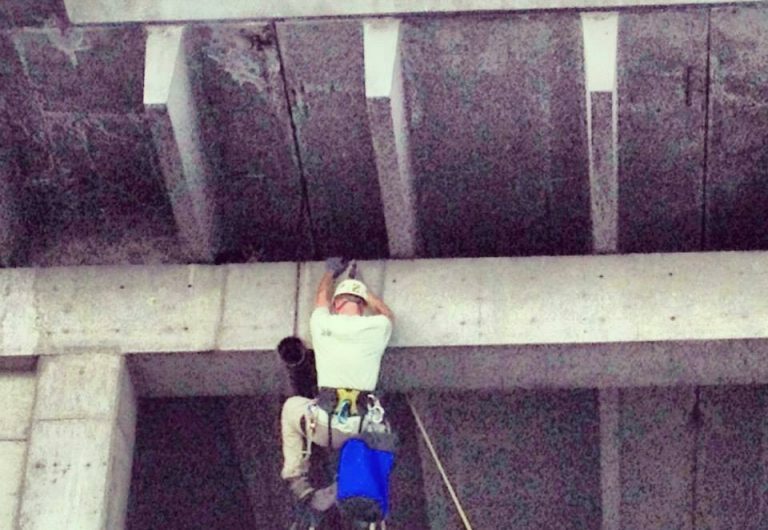 After being thanked by the owner over and over, he returned to work, now inspired by his own heroic act. As soon as he got home, Shaun called up his colleague and buddy Tom Otto to tell him all about his fearful feline experience. They realized that if Hamburger Belly got herself in such trouble, other cats must’ve be doing the same thing all over the state! 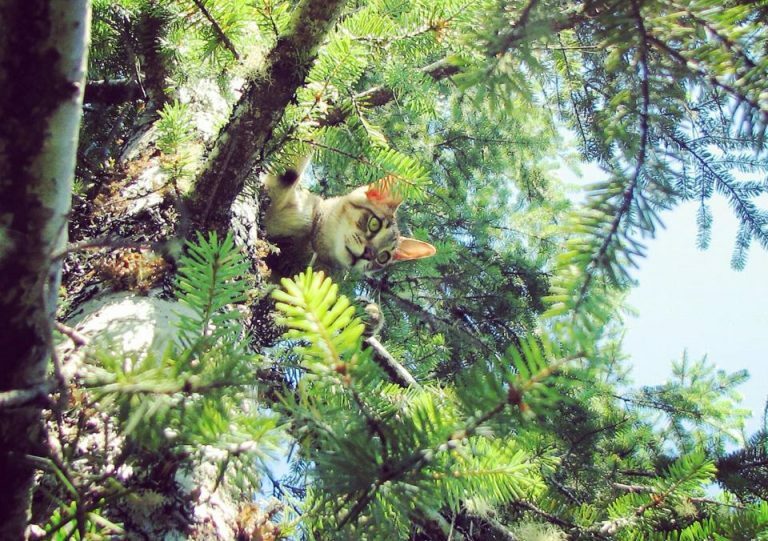 Worse, they figured many people who notice a cat stuck in a tree don’t know who to call — they contact the fire department, vets, animal control, even the police, but most of those organizations don’t have professional tree climbers on staff. 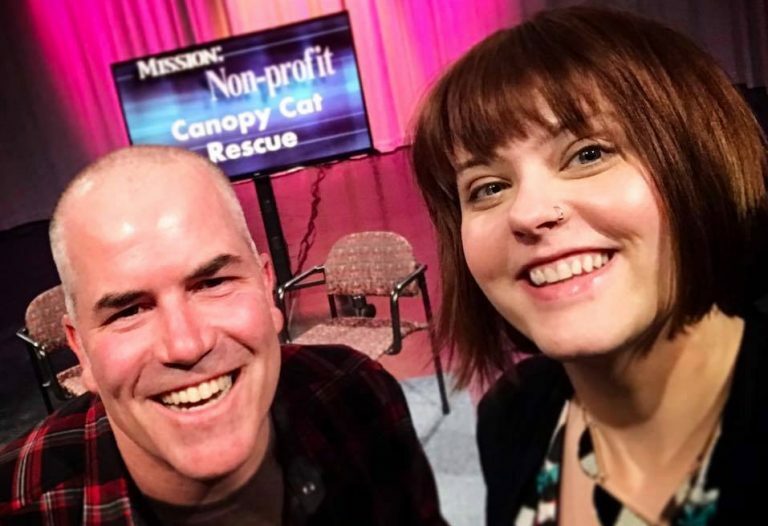 Thus began the animal rescue organization called Canopy Cat Rescue, which was comprised of Tom and Shaun plus some volunteers. 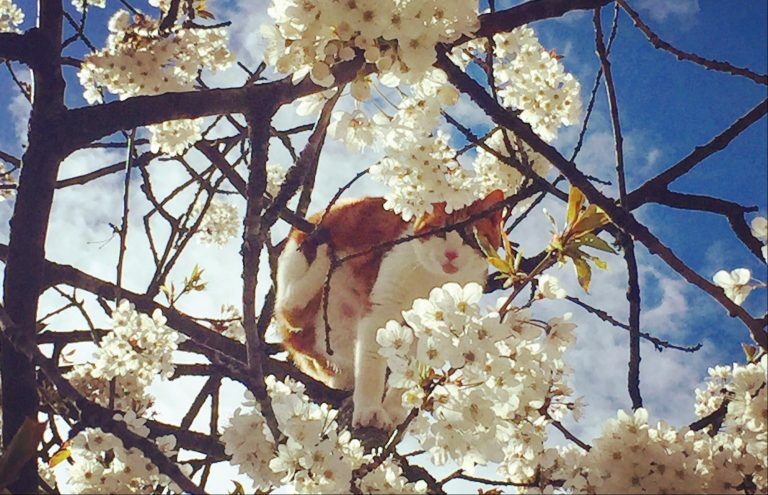 Every day they took calls from people whose cat had climbed up a tree. 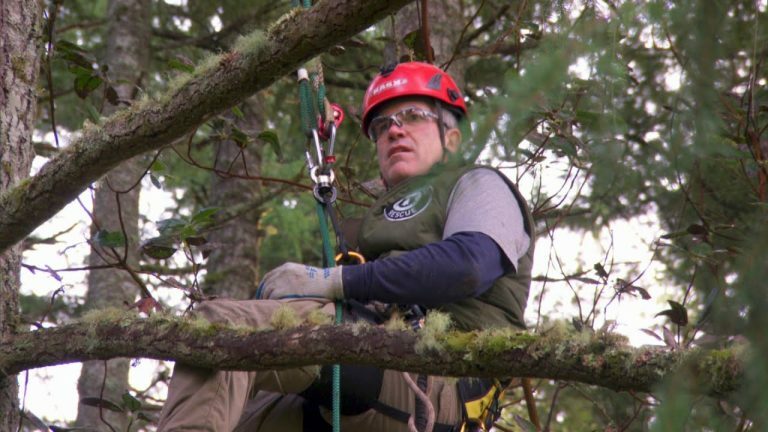 And since Shaun and Tom were both arborists, they were experts in the field of trees, they were great at assessing any danger or challenges, like dead branches or places the cat could slip and fall. When the guys eventually get to the cat, they usually try to befriend it first to earn their trust. They don’t bring food or treats because the cats aren’t interested in eating at that point. 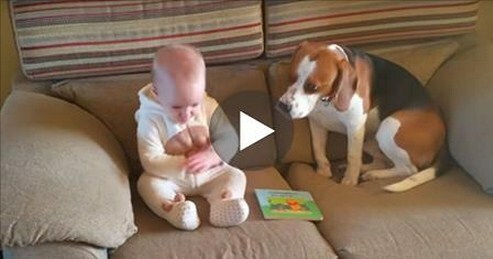 Just calling them by their name and giving them some pets usually does the trick. But that doesn’t always work. 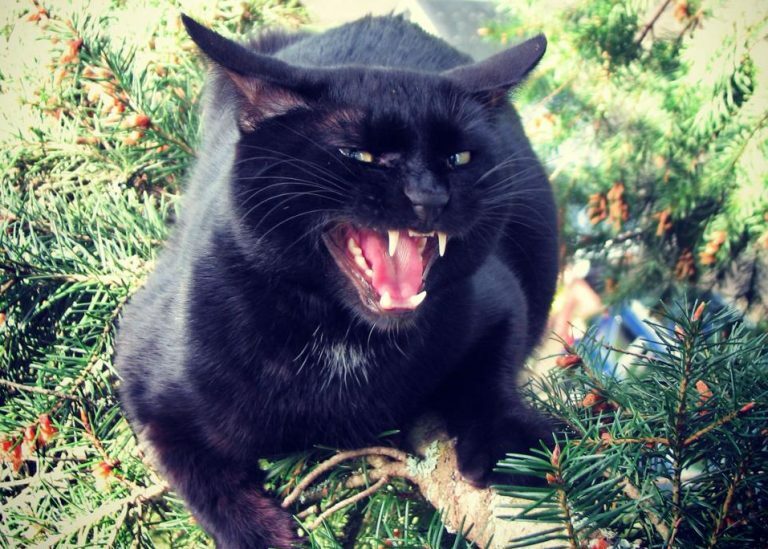 Some cats become terrified when a human approaches them, so they hiss, bite, or climb to a spot in the tree that the guys couldn’t reach. In cases like those, they had a big net ready to catch the little rascals! Still, to their surprise, Shaun and Tom found that most cats were actually so happy to see them after being stuck for so long that they’d come willingly. Some even gave the duo a little cuddle and purr! 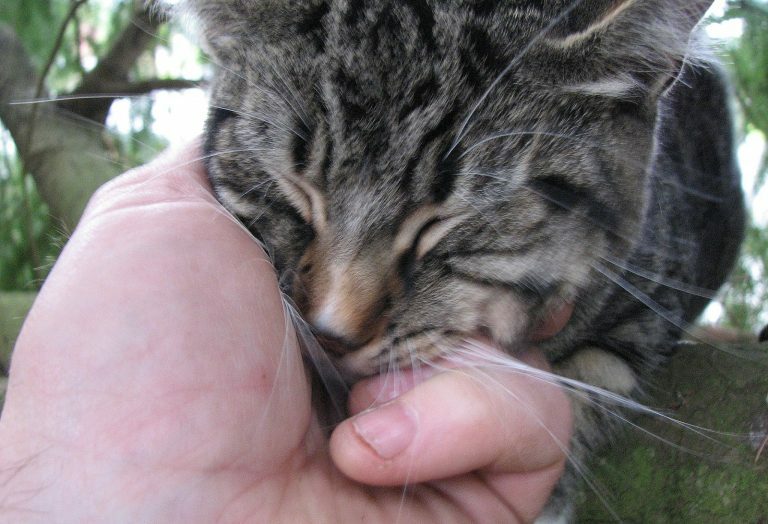 Some cats weren’t called in by their owners, but a good Samaritan who spotted the feline. 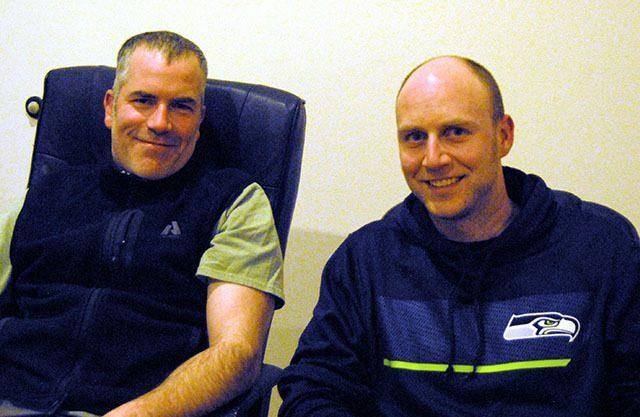 Shaun and Tom would rescue those cat’s, too — but then they had to find the owner. 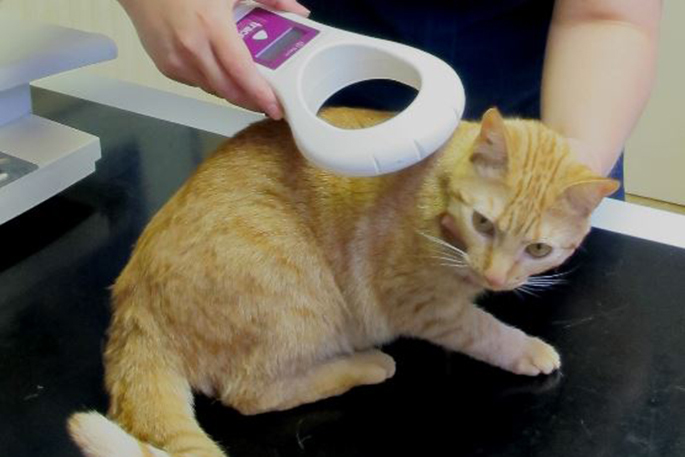 If the owner of the cat was unclear, they usually took the furry friend to the vet to see if they’d been chipped with an address. If they weren’t, they were brought to a no-kill animal shelter in the hopes of finding a forever home. 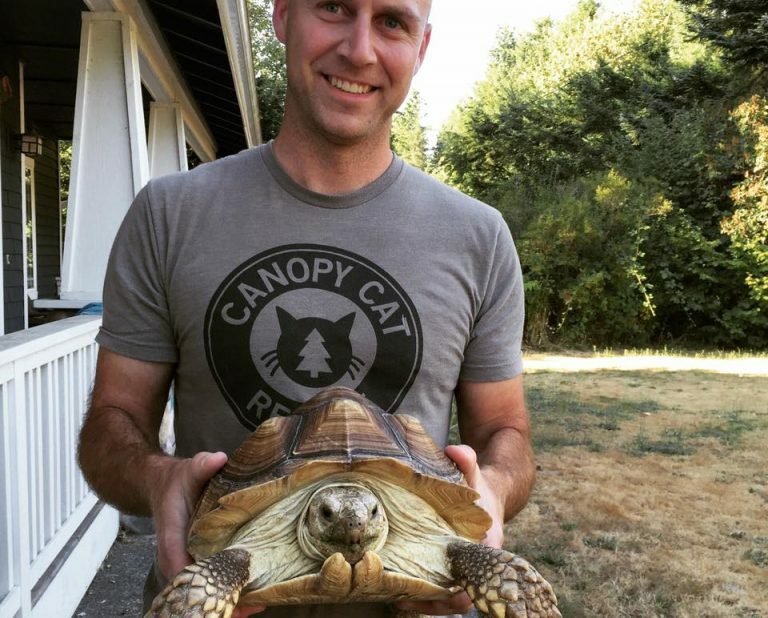 Canopy Cat Rescue is based in Seattle, so the fellas do most of their work in the western Washington area. However, they have traveled over 200 miles for certain cats because they can’t stand the idea of the cat remaining helpless. 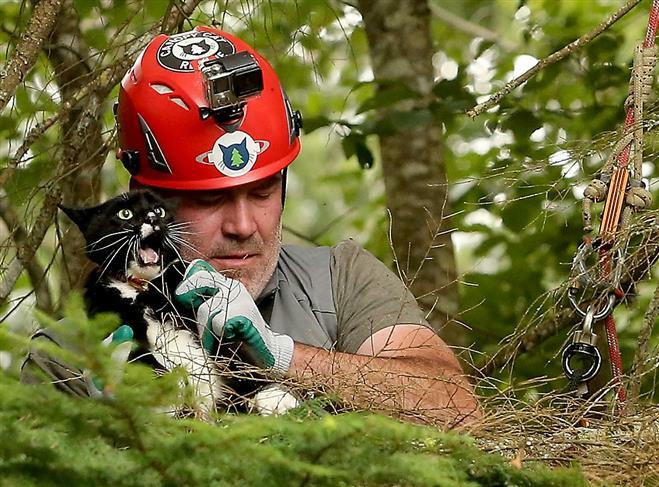 In 2018, for instance, they rescued a cat named Boots who had been stuck for two weeks in Lebanon, Oregon. 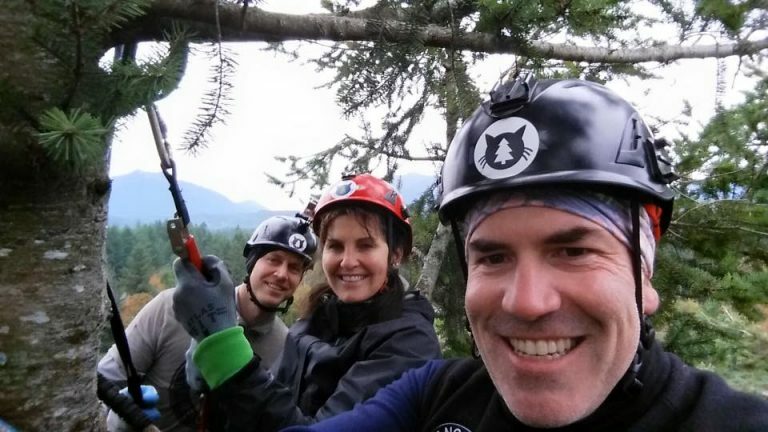 The location was way beyond Canopy Cat Rescue’s coverage zone, but the owner was desperate. “I was like, ‘I can be there in five hours,’” Shaun said. 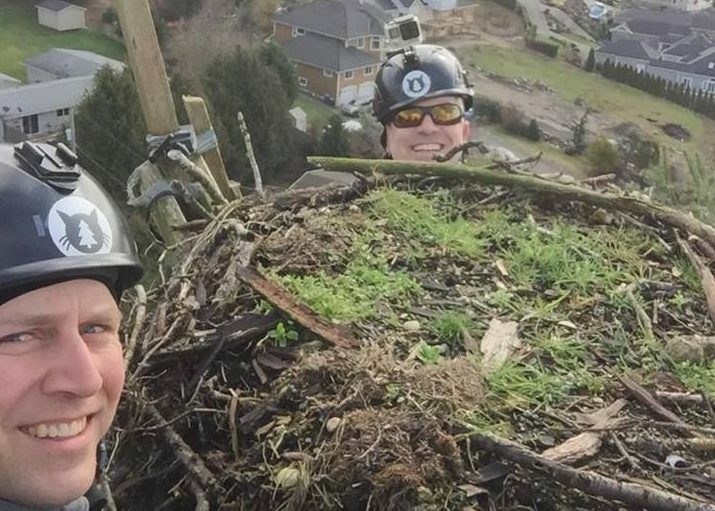 In fact, Shaun and Tom didn’t only go out of their way to rescue cats, they also go out of their comfort zones. While they pride themselves on being expert tree climbers, they also use their gear to reach cliffs and river dams from time to time. 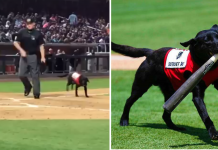 They don’t discriminate in any way: they come to the rescue whether the cat is near or far, domestic or feral, cat or… no cat at all? That’s right, they rescue other animals like this giant tortoise! All the work done by Canopy Cat Rescue is done without any fees. “We believe all cats deserve to be rescued, regardless of someone’s ability to pay,” the guys explained. However, they do accept donations and sell merchandise for extra cash. 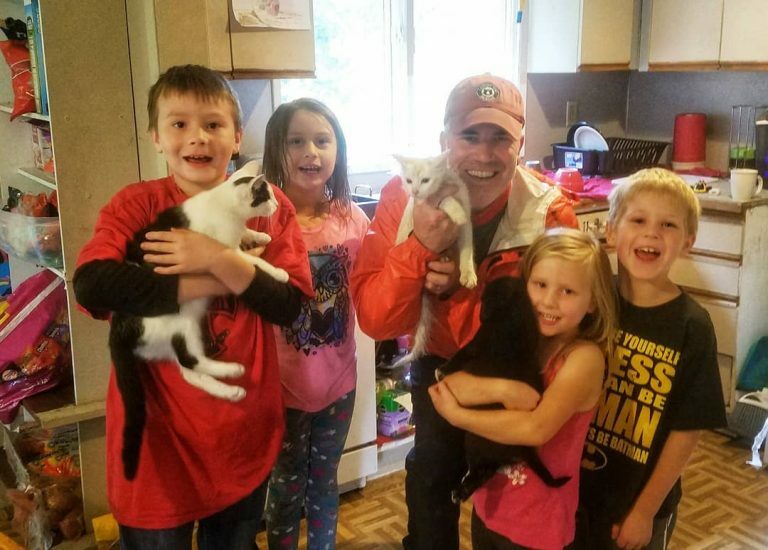 Most of the time, getting donations is no problem, as owners reunited with their four-legged friends tended to be very grateful, and helped raise funds for the organization’s gas, climbing equipment, and other necessities. 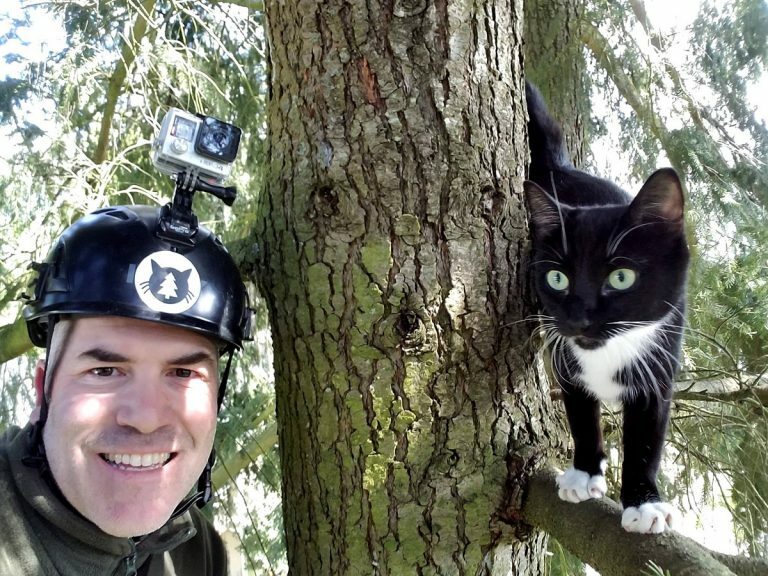 As time passed, Canopy Rescue Desperate Cats earned more attention from both the media and cat-spotters; they were covered by newspapers, local news channels, and even had a stint on Animal Planet! 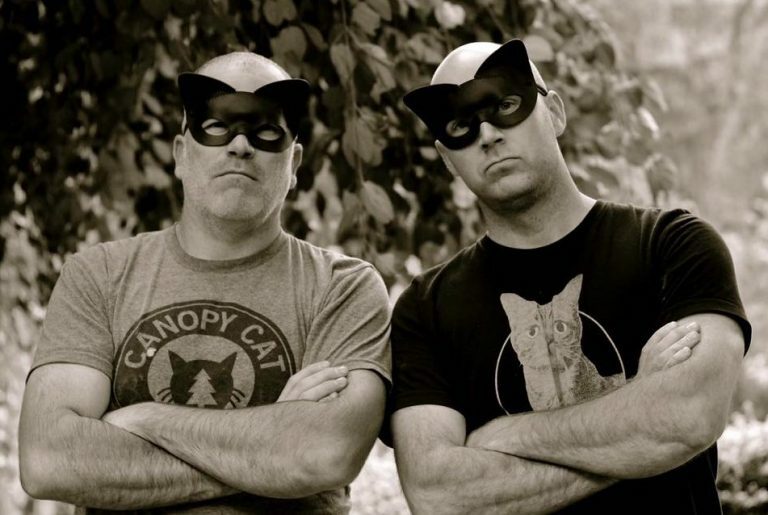 Since the day they rescued Hamburger Belly, Shaun and Tom have rescued over 3,000 cats through 11 years. As their popularity grew, so did their number of rescues. 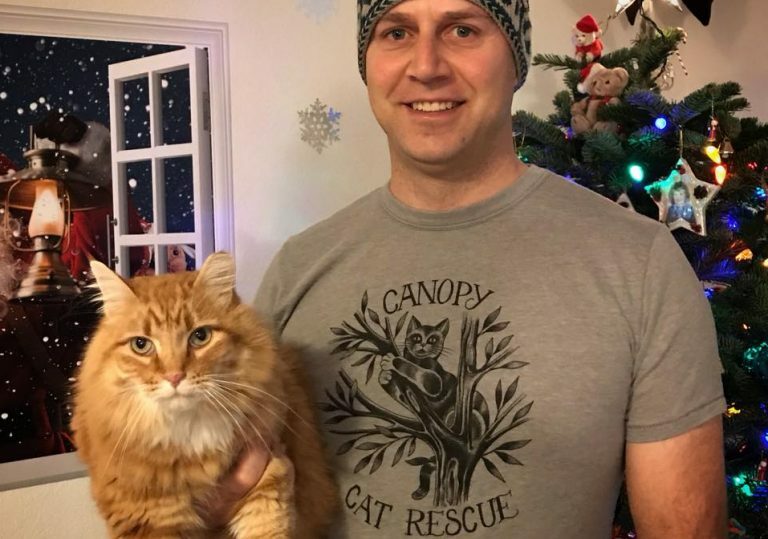 They saved well over 500 cats in 2018 alone. “A lot of people call us heroes almost every day, but we don’t think of ourselves that way,” said Tom. 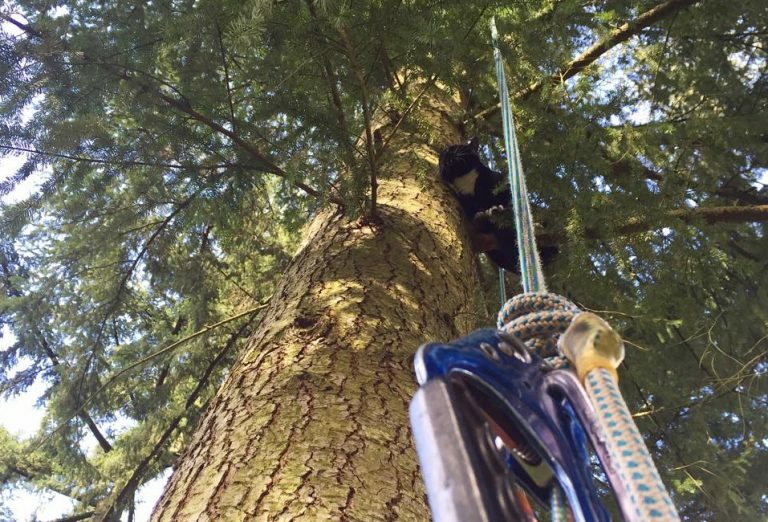 Regardless of how the guys see themselves, we certainly think that climbing 100-foot tall trees to help a scaredy cat is a pretty heroic way to live! 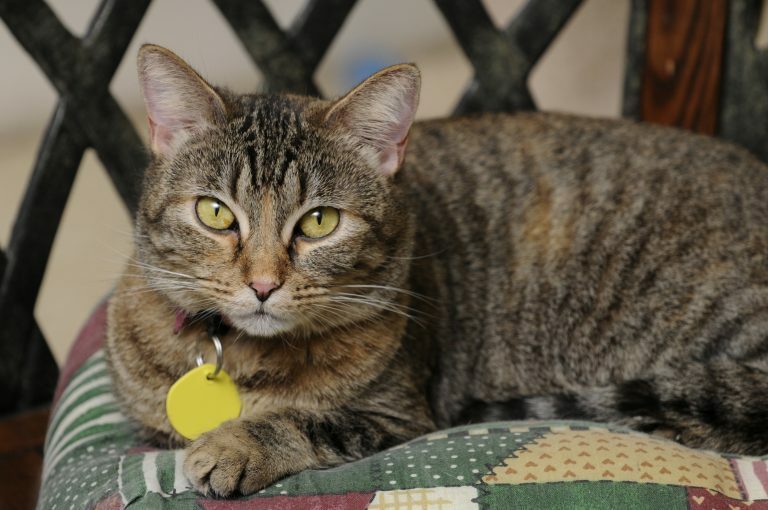 Share this story of Desperate Cats with friends.